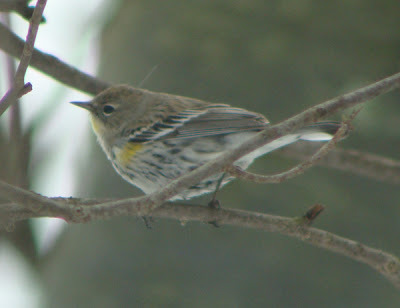 A week ago I noticed this photo of a Yellow-rumped Warbler from a backyard near Grand Rapids, MI. 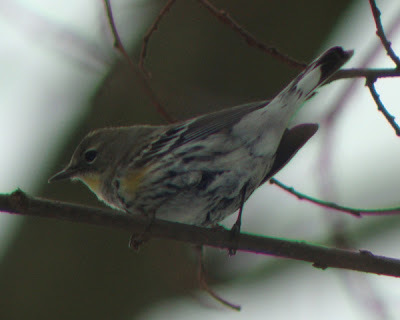 I immediately noticed the yellow throat and suspected it may be an Audubon's Yellow-rump, not the familiar Myrtle which is the normal form here. 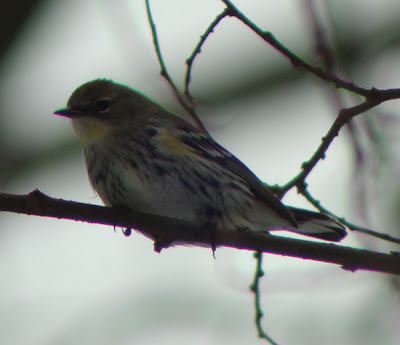 Today I finally was able to make an effort to see this bird, and I was rewarded with the following photos. 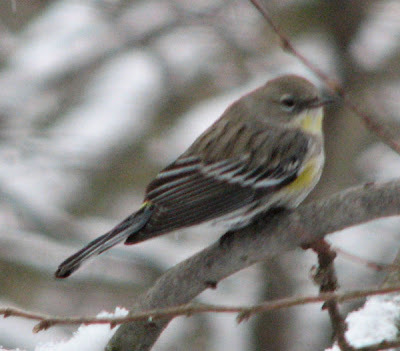 There are only 2 accepted records of Audubon's Warbler in Michigan. Although most of the time this bird looked very plain-faced, there was at times a very slight suggestion of an outline to the auricular, something perhaps suggestive of a Myrtle X Audubon's intergrade. I would really appreciate the thoughts of those familiar with this species in all its forms. My field notes mention a faint pale spot on the supraloral as well as a rearward and upward extending pale mark from the top eye arc, and that the throat appeared not to have a rearward extension coming up behind the auricular. 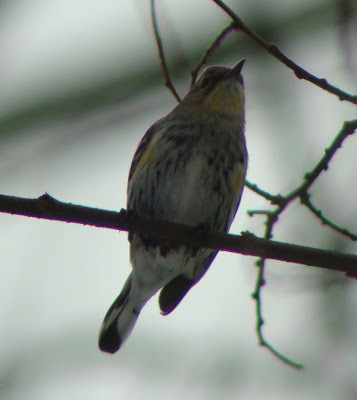 From most angles, the throat appeared uniformly yellow, concolorous with the flank spot, but the brief views I had seemed to suggest some whitish admixture of color along its anterior and lateral borders. My field notes also mention the suggestion of a pale eyeline posterior to the eye, extending a very short distance rearward. Copyright Bob Tarte 2007. In this photo, the face appears extremely plain. Copyright Bob Tarte 2007. Here the exposure is slightly different, creating the appearance of a more contrasty head pattern. Copyright Bob Tarte 2007. Here the pale supraloral and rear top eye arc extension can be seen, although they appear more pronounced here than in many of my views in the field today. This map shows the location of the bird from today. It is certainly on a winter territory and should be present for several more weeks should it survive. 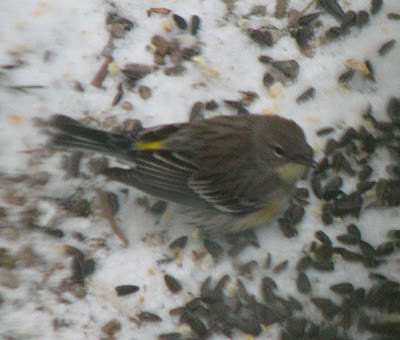 The left arrow shows the residence at which the bird is very infrequently seen at a suet feeder. 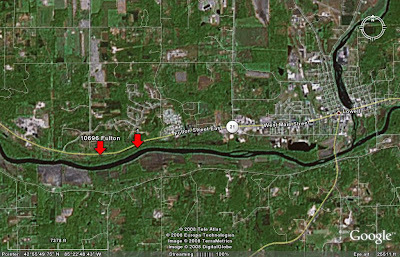 Today I first located the bird at the right arrow- about 1/4 mile east of the property in a band of woodland between Fulton (M-21) and the Grand River. The plot is either state or county owned according to Bob Tarte, the homeowner, and he felt birders could park on the roadside without much trouble. Traffic is fast here, however, so be careful. NOTE: be sure to wear rubber boots as the snow is deep and wet here! Directions: Take I-96 to the Lowell exit and go north into downtown Lowell. Turn left at M-21 (Fulton) and go about 3-4 miles west of town. After crossing Cumberland, look for a blue house with a red barn on the south (left) side of the street, address 10696 (difficult to see the numbers near the front door frame). The homeowner and finder of the bird is Bob Tarte, who can be reached at 897-9202 if you want to ask him whether the bird is being seen. 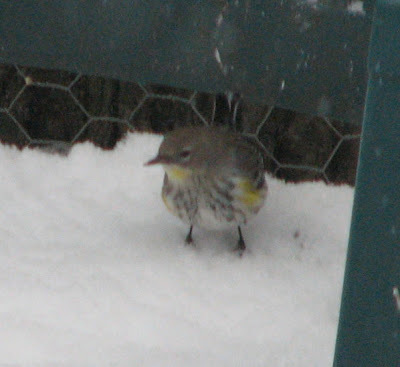 It is seen between zero and a few times per day at the suet feeder directly behind the house, and on the green lawn chair beneath it. However, there have been periods up to a week or more where it isn't seen here, and you should be prepared to walk east along the river listening for mixed species flocks. 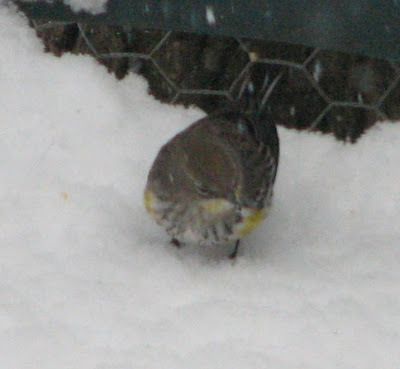 I found it all by itself (no other Yellow-rumps), only loosely associating with titmice, chickadees, creepers, and nuthatches. 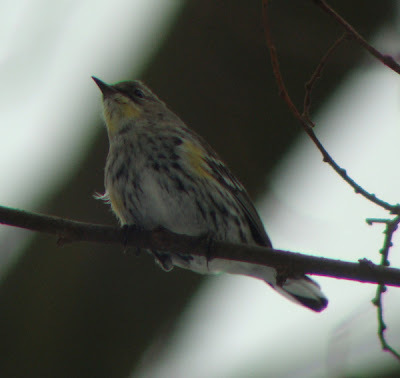 It was very high in the treetop, and was only attracted down by use of an iPod and Audubon's Warbler chip notes. Had I not had the iPod and speakers I certainly would not have been able to get a respectable look at this bird.